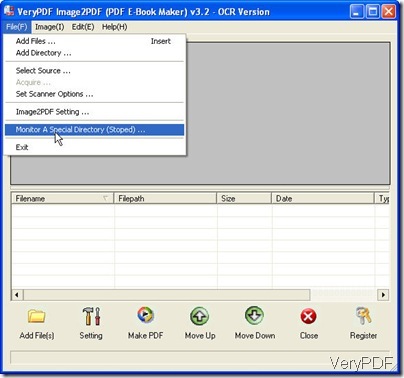 ← How to create PDF document with virtual printer? 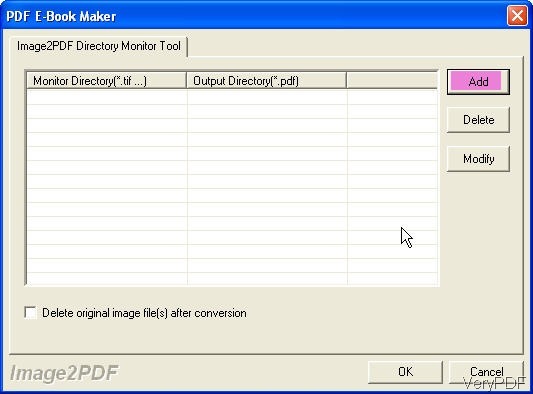 In this article, I will show you how to monitor folders then convert all the image files in this folder to searchable PDF files without changing name. 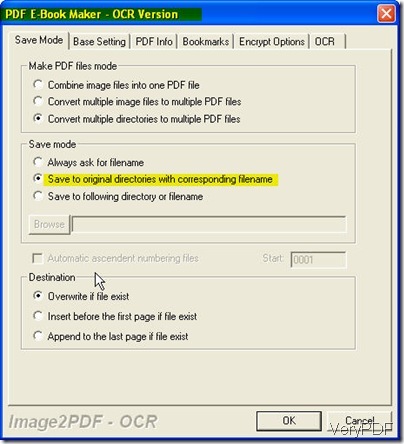 Also, you can connect scanner with the conversion, which means you can finish scanning documents to image file then converting image file to searchable PDF file. Monitoring folders, can you get what does it mean? For better understanding, I will put it in this way. Once you add files to the monitored folder, the files will be converted to searchable PDF files at once. In the following chart, I try to compare the traditional way and the new way for converting image to searchable PDF. Now let us check how to fulfill the unattended conversion. 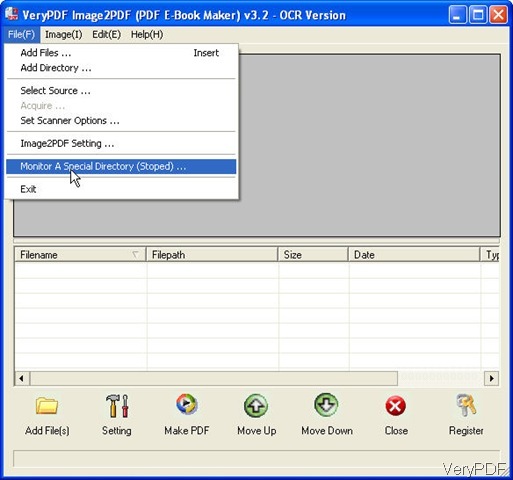 First, download Image To PDF OCR. This software is free downloading and free trial. You can free use it many times. When you download it successfully, there will be an icon on the desktop. Double click it, you can enter its interface. Now let us check a little bit from the following snapshot of its interface. 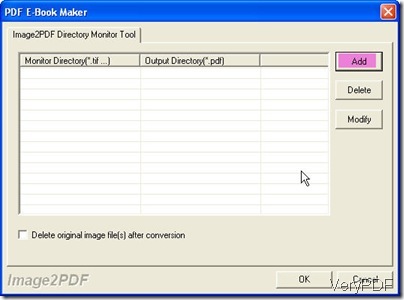 I have shown in the snapshot for the option Monitor a special directory. Second, go into the Monitor a special directory option menu and setting menu. In the Monitor menu, you can add monitored directories as many as you need by clicking the Add button. Now the Setting menu option snapshot. 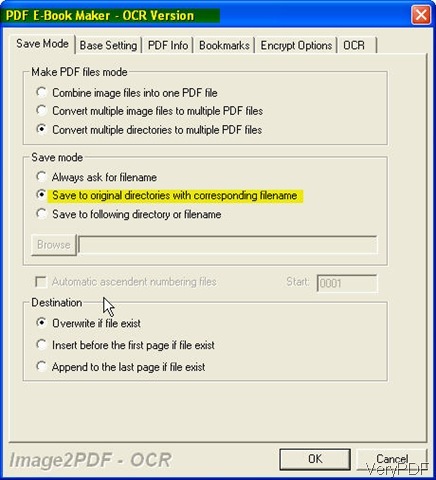 In the setting menu, you can choose to save the converted PDF files in the same directories by the same name. There are also many other options for you to choose. Of course, if you need to add information for PDF file or encrypt PDF file, you can also set in this menu option. If you have finished the setting part, you can click the button OK to back to the main interface. During the conversion, if you meet any question, you can visit its homage to have a check. When you back to the main interface, just simply click the button Convert, the image file will be converted to searchable PDF at once. The above steps, you only need to set in the first conversion. In the following using, the conversion will be processed automatically. There are many software like this one which also focus on file format conversion on VeryPDF. When you need software for file format conversion, this website will be a wonderful place for you. This entry was posted in Image to PDF Converter and tagged image to searchable PDF. Bookmark the permalink.